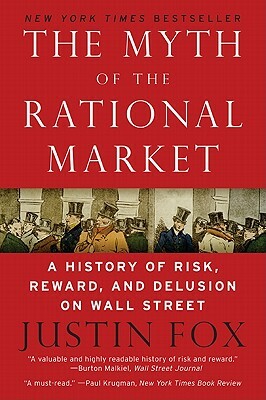 A lively history of ideas, The Myth of the Rational Market by former Time Magazine economics columnist Justin Fox, describes with insight and wit the rise and fall of the world’s most influential investing idea: the efficient markets theory. Both a New York Times bestseller and Notable Book of the Year—longlisted for the Financial Times Business Book of the Year Award and named one of Library Journal Best Business Books of the Year—The Myth of the Rational Market carries readers from the earliest days of Wall Street to the current financial crisis, debunking the long-held myth that the stock market is always right in the process while intelligently exploring the replacement theory of behavioral economics. Justin Fox is editorial director of the Harvard Business Review Group, and a contributor to Time magazine and PBS's Nightly Business Report. Previously, he was a columnist at Time and an editor and writer at Fortune. He lives in Cambridge, Massachusetts, with his wife and son.